As Merleau Ponty explains it is only while immersed in the environment and aware of that experience can we understand enough to model our relationship with it. It is therefore important to study experientially the actual phenomenon of perception first hand. Experiential awareness provides insights to the perceptual structure through which we develop our relationship with the real. The difficulty is to capture and manifest these interactions in a tangible form in order that scientific evaluation processes can be reliably applied. Although subjective in nature, well choreographed intuitive accounts can clearly identify the fundamental patterns and processes that together constitute perceptual awareness. 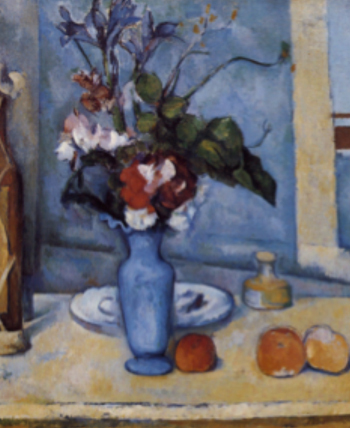 As the Blue Vase of Cezanne illustrates, the so-called deformations in visual art show us flashes of perceptual structure. Visual artists report their intuitive and direct observation and interaction with their environment through their artworks leaving physical traces of the engagement processes. These records contain vital information with respect to the nature of objectivity that has an appreciable impact on viewers from all cultures. For example, the Impressionists have left in their paintings traces or flashes of perceptual structure that engage most of us. These painters have to some extent rendered visible their ‘experience of reality'. By engaging in such methodologies it is possible to substantiate aspects of awareness that hold profound implications for our approach to information display and our interaction with it. The patterns and data structures contained in art works can with careful consideration, be quantified and modelled into algorithms to be deployed in digital technology providing a tool set and a controllable stimuli production platform for testing and evaluation purposes. It is envisaged that these stimuli and the processes involved in their generation can be integrated into cognitive architectures and used to deepen our understanding of brain structure, neural firing and neural pathways tracing back to receptor firing in the retina. Vision-Space technology is an example of such an experimental cycle merging the intuitive records of visual artists with the emerging understanding of the computational structures operational within the phenomenon of vision. In this way we can consider that Vision-Space takes the first steps in modelling visual awareness. Vision is widely considered to be the lead sense and hence, the discipline of Visual Art provides a valid and strong skills base to intuitively probe the fundamentals of perceptual structure on a psychophysical basis. that we receive (retinal processing) through our visual system (visual pathways) two independent ‘takes’ of the physical world (what and where characterisations) and that this duality manifests within our presentations of vision. that phenomenal field (perceived visual field) can be understood to be multifaceted even on a monocular basis. Vision-Space identifies two independent monocular data formations (data-sets) associated with explicit (macular vision) and implicit (peripheral vision). that there are cognitive processes that manage the juxtaposition of the data-sets within phenomenal field. that these data-sets can perhaps broadly be aligned with independent forms of attention (sub-conscious and conscious/right and left hemisphere ‘takes’ on reality).